I downloaded Zombie model Pxltiger from the AssetStore, combined meshes in order to manipulate renderer of each parts easily. To run animation we need to configure an Animation Controller fort the character and link the controller to Animator component. The guard also needs Perception component, but the component should be on head, so the location used to track seeing at head where the eyes are. I just first create an empty GameObject and attach perception component to it. 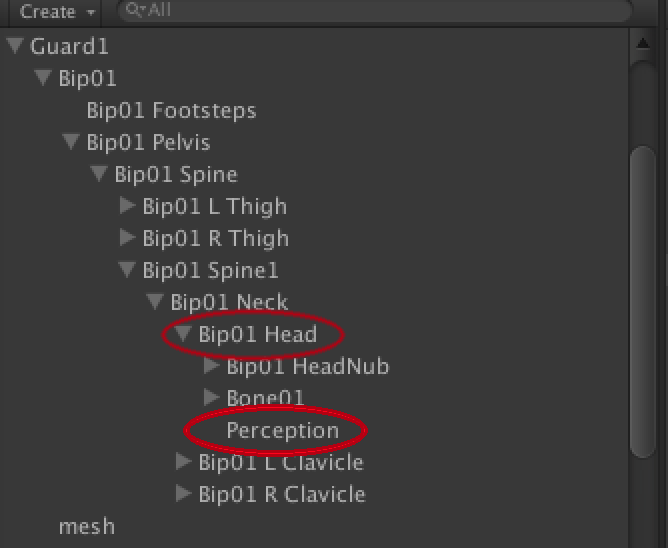 Drag the Perception object under Bib01 Head and check that the object is in the right height and facing correctly. Guard set-up. Line shows where the perception component is and where it is looking at. I changed material of the Zombie and now shader is Standard (Specular Setup). The Albedo texture is grey metal, specular colour is grey. Then I draw textures for electricity charges and placed them to specular texture using the the original Zombie texture to place the charges. I also want to guards to be metallic looking when they patrol or do nothing and specular when a guard sees or searches the player object. I have total seven different specular textures that will be used in texture animation. The animation is controlled by the following script. // is not selected twice a row. EDIT. Note that the scrip manipulates material. If you have multiple objects in a scene using this scrip, all of them should have their own materials. Otherwise all instances will manipulate the same material and the instances will have exactly the same animation. I want to the Guard to be able to attack. 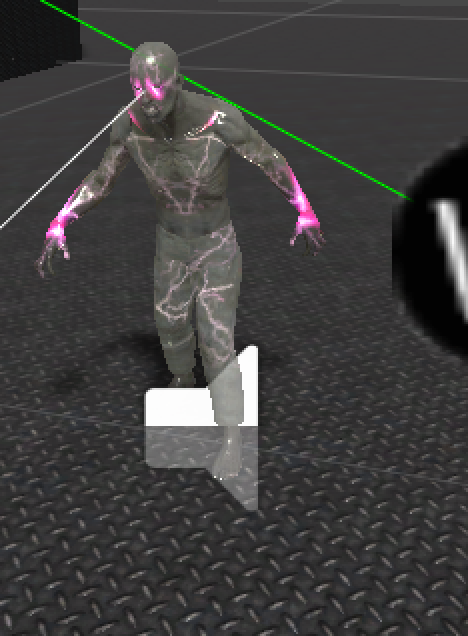 Instead using the Zombie attack animation and implementing melee, I create electricity ray that the guard shoots from its eyes. This attack can be drawn using LineRenderer. // disabling the render and this component, so by default the attack is not drawn. // then we add random variation to the end of each piece. Following image shows AttackVisualiser object setup. Next step is to implement Guard AI. Image below illustrate how the guard should behave in certain conditions. Even there is rather limited amount of states, the state machine starts to be rather complicated. A behaviour tree is probably more suitable with anything more complicated that this. Attack needs sound. Get one, for example, from http://www.freesound.org/ and attack that to the game object. 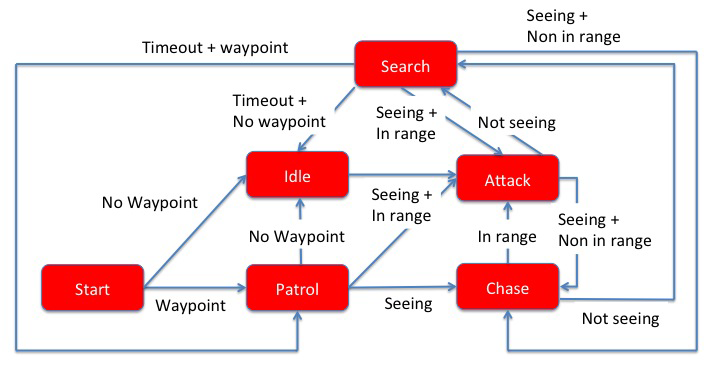 Now we should be able to test the guard using the same patrol route used with the SimpleAgent.